보고서는 탄소 포집 및 저장(이하 CCS)과 관련된 운영 책임에 관한 법적 문제들을 다루고 있다. CCS 활동은 발전소 또는 공장에서의 CO2 포집, 파이프, 해상 및 육상 수송을 통한 농축 상태의 CO2수송, 내륙 및 바다의 깊은 지하에 CO2 장기저장이라는 세 가지 별개의 활동을 포함한다. 포집과 수송에 관련된 책임 문제는 다른 산업 활동에 관련된 문제들과 크게 다르지 않을 것으로 보인다. 그리고 적용되는 법이 상당부분 중복됨에도 불구하고, CO2 저장은 적절한 책임 제도를 고안하는데 상당한 과제를 만들어낼 수 있고CO2 저장기간이 매우 길며 사용하는 기술이 아직도 상대적으로 새로운 기술이기 때문에 이 보고서는 저장에 초점을 맞추고 있다. 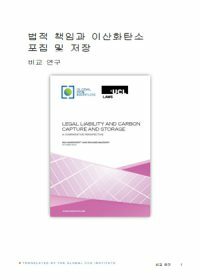 Korean translation of Legal liability and carbon capture and storage: a comparative perspective . 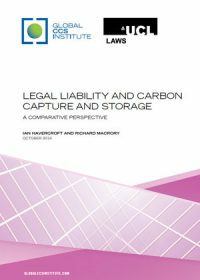 Legal liability issues remain critically important for the commercial development of carbon capture and storage (CCS). 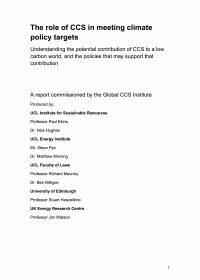 This co-authored report by Global CCS Institute and University College London largely focusses on the storage aspect of the CCS process. Storage is where the most distinctive liability challenges lie, largely due to the long time-scales involved. Civil liability where third parties who have suffered harm seek compensation or a court order. Administrative liability where authorities are given powers to serve some form of enforcement or clean-up order. Emissions trading liability where an emissions trading regime provides a benefit for CO2 storage and an accounting mechanism is in place should there be subsequent leakage. International policy makers are increasingly viewing CCS technology as an appealing climate change mitigation option. However, as yet there is no overarching international agreement or regulatory framework governing the 'full-chain' of CCS activities, either onshore or offshore. Various amendments have been made to the international and regional marine agreements, as well as proposals for new accounting methodologies under the international climate change agreements. As things progress, with many jurisdictions seeking to develop similar regulatory frameworks, it will be important to monitor the relationship between international, supranational, national and sub-national legislation. EU Member States have an obligation under EU law to transpose the provisions of the CCS Directive into national law and must communicate the text of any such laws and other administrative measures to the European Commission. The deadline for communication specified in the Directive was 25 June 2011. CCS legislation in the Australian context. CCS legislation in The Netherlands. Onshore CO2 storage legal resources considers the legislation and associated issues relating to onshore CO2 storage in Europe and Australia. Here we consider how CO2 storage is dealt with at a federal and state level in Australia. At a state level we consider the state of Victoria, that enacted The Victorian Greenhouse Gas Geological Sequestration Act 2008 (No. 61 of 2008) which provides a dedicated legal framework enabling the onshore injection and permanent storage of greenhouse gas substances. Offshore CO2 storage legal resources covers activities relating to offshore CO2 storage in specific regions. This section looks specifically at the UK regulatory framework and the enactment of the Energy Act 2008, which is a framework for the licensing, enforcement and registration of CCS. Here we consider the regulatory framework created by the Australian Government for offshore CO2 storage based on amendments to existing petroleum legislation. Here we consider the legal implications of transporting CO2 across international boundaries, for storage in marine environments, and more specifically, how CO2 transport for storage is dealt with in the European, UK and Canadian contexts. In the UK at present no legislation that expressly regulates CO2 transport by pipeline. The Health and Safety Executive (HSE) and the Department of Energy and Climate Change (DECC) have suggested CO2 be classified as a 'dangerous substance' or a 'dangerous fluid' and legislated accordingly. ​In Canada, there is no dedicated legislation regarding CO2 pipelines, either at federal or provincial level. Existing CO2 pipelines operate for the purpose of enhanced oil recovery (EOR) or acid gas disposal and are covered by existing pipeline legislation. What are the key applicable laws and principles? The concept of property is concerned with the ownership of tangible or intangible things. Property rights can be conceived of as a bundle of rights that include, in addition to the right to own, the right to use and the right to enjoy. Property law comprises the rules and principles governing these proprietary rights. Legal principles concerning property often vary between different national and sub-national jurisdictions, but there are common concepts and questions that need to be asked when dealing with CCS issues. Law uses the term 'property' in a number of different ways. 'Real property' refers to property of the land and anything growing on it, attached to it or built on it. Real property includes the physical property of the land, such as soil, and fixed assets such as buildings. More importantly, it includes legal rights concerning the land, such as a right of way or the right to extract minerals. Private property can refer to tangible assets over which the owner has exclusive and absolute rights, such as the wellhead equipment at a CO2 injection operation. The last is public property, which is not restricted to any one individual's use or possession and is owned by a public body. Intellectual property comprises commercially valuable products of the human intellect, such as a patentable capture technology. Though relevant to the commercial development of CCS, it will not be discussed in this section. Property rights are a key legal aspect of CCS operations. Determining property interests at a storage site is essential to acquiring the necessary surface and subsurface rights for injecting and storing CO2 in the target geological formation. Where CO2 is transported to the site by pipeline, property rights for constructing pipeline infrastructure must also be considered. The process by which property rights are granted to an operator can affect the cost of the overall CCS operations. Establishing how these rights are acquired, maintained or transferred over the lifetime of the project has implications for managing the liability for CCS projects. Liability for CO2 during the active injection phase of a project generally lies with the operator, who must have a right to store in the subsurface formation into which the CO2 is being injected. The right to this storage plus the stored CO2 must follow the entity that takes on the long-term stewardship of the storage site, whether it remains with the operator or is handed over to the state. The legal treatment of property rights for CCS is frequently based on regimes governing property rights for natural resources. Mineral rights regimes are of particular interest given the analogous nature of oil and gas operations to CO2 transport and storage activities. Water rights are also pertinent since underground saline formations have significant potential for large-scale storage. Historically, real property rights were based on the traditional principle that the owner of a piece of land owns everything above it and below it to an infinite extent. (This is the Cuius est solum, eius est usque ad coelum et ad inferos maxim, meaning 'whoever owns the soil, it is theirs up to Heaven and down to Hell' normally called the 'ad coelum doctrine'.) Thus, the owner of a piece of land would have exclusive rights to the surface and also any subsurface mineral interests. A mineral interest constitutes the rights to search for, develop and remove minerals from the subsurface. The surface estate includes all the rights to the real property of the land excluding the mineral interest. It can include subsurface substances not deemed to be minerals, such as gravel or water resources. Property rights have evolved, and often the mineral interests have become separated from the ownership of the surface either through outright sales or a lease, resulting in different owners of each. In many jurisdictions, such as Australia, many countries of the European Union and Latin America, the mineral interest is vested in the state, resulting in no private ownership of minerals. In these jurisdictions, the state grant licences for the exploration and extraction of minerals beneath a surface owner's land. In a country such as the United Kingdom some minerals (coal, gas, gold and silver) have been acquired by the State under legislation, but other minerals remain with the landowner. Conversely, in the United States, all mineral interests in principle are privately held and cannot be expropriated by the state without compensation. In the context of CCS, the most important component of the property interest is the subsurface pore space. In simple terms, pore space is the geological formation where CO2 is stored. With regard to storage in depleted hydrocarbon reservoirs, the ownership of the geological formation varies between jurisdictions. In some jurisdictions, such as Canada, ownership of the geological formation remains with the owner of the mineral interest after the minerals have been extracted. In others, such as in many US states, ownership of the geological formation remains associated with the surface estate. In jurisdictions where the mineral interest is owned by the state, pore space is typically also vested in the state, though this is not always clearly specified by existing laws. In some jurisdictions, legislation has now been passed to make clear that the state owns the pore space, for example, in the Province of Alberta in Canada. Where mineral rights are in principle vested in the owner of the land but are now held by someone else (either through a sale or a lease), difficult legal questions can arise as to who owns the pore space for storing CCS - the owner of the mineral rights or the original landowner? Similar questions can arise for storage in saline formations, though the ownership of pore space in this type of formation may follow ownership of water resources more generally. In any event, it is likely to be important to look at the precise terms of the sale or lease of mineral interests relating to individual storage sites to determine the exact circumstances. Covenant: An agreement, usually in the form of a contract or deed between estate owners, that real property will be used in a certain way. A covenant may constitute a pledge to do something or refrain from doing something. A simple example of a covenant is the requirement to fence in surface installations at a CO2 injection site. Property rights may be acquired through voluntary means, involuntary means or adverse possession. Where land is privately owned, the landowner can decide to sell it or lease the surface or mineral interest to another private entity. Similarly, interests in publicly owned land can be sold or allocated for use to a private entity. In other cases, without requiring the consent of the private landowner, the state may have the power to take private property for its own use or to authorise the use of private property by a third party. Depending on the legal regime, the state may have to compensate the landowner for the property. These involuntary means of acquiring private property have different terms in different jurisdictions: eminent domain, compulsory purchase/acquisition, resumption, and expropriation. Lastly, property may be obtained through adverse possession of another's land for a continuous and uninterrupted period of time. Also relevant to the discussion of property rights and CCS are the property rights of adjacent landowners in the event of activities that infringe on the property of another. Examples could be unintended migration of CO2 outside a selected storage area or impacts on a mineral resource from injected CO2. A landowner or tenant enjoys protection from illegitimate entry onto or interference with his property. Any wrongful entry on his real property constitutes a trespass. Any activity or situation that interferes with his use or enjoyment of property constitutes a nuisance. The landowner may take legal action to seek to stop an activity deemed to be trespass or nuisance or to recover damages incurred. In the CCS context, some instances of trespass are unambiguous. 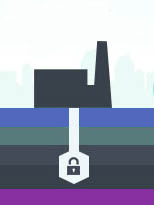 For example, where mineral and surface interests are severed, unauthorised use of the surface to access the subsurface would be considered trespass. However, in a case where substances injected into the subsurface migrate unexpectedly to neighbouring land, determining whether trespass has occurred is less straightforward. International law does not generally regulate real property rights, leaving these issues to be dealt with under national law. As an example, international law is silent on whether natural resources should be held in either public or private ownership. However, international law does play a role in regulating the enjoyment of such property rights by foreign nationals within the host state's borders. This is found particularly in the field of foreign investment law and international human rights. Despite its silence on how property rights over natural resources and land should be regulated, international law imposes some restrictions on the way a state exploits the natural resources that are either under its sovereignty, shared by multiple states or held in common by all states. General obligations to exercise due diligence and adopt a preventative/precautionary approach in the use of a state's territory are imposed under international law in order to avoid transboundary harm to the territory of other states. States' cooperation in conservation, sustainable utilisation, and environmental protection are also required with respect to the exploitation of shared resources or resources in areas beyond national jurisdiction. Pore space ownership has yet to be clearly articulated in some jurisdictions, resulting in uncertainty for permitting CO2 storage operations. In jurisdictions where the mineral interest is vested in the state, it is often assumed that the state also owns the pore space. However, governments that have declared ownership of valuable subsurface substances (e.g. coal and hydrocarbons), have allowed ownership of other subsurface substances to remain with the surface estate. For example, less valuable subsurface resources such as sand and limestone are sometimes associated with the surface estate. Therefore it is not necessarily clear that pore space would be automatically vested in the state just because there is no private ownership of the mineral interest. Some governments have resolved this issue by declaring that ownership of pore space is vested in the state. This was done, for example, in the Canadian Province of Alberta. In the United States, this type of declaration would not be possible without compensating landowners, since private ownership of the mineral interest is extensive. In many jurisdictions there is still no process for allocating CO2 storage rights or granting access to the subsurface. This process must consider competing uses of the property in question, especially how to prioritise CO2 storage rights versus oil and gas production. The duration of a right to store CO2 is linked to the long-term liability of the storage operation. In the predominant model for managing liability, the liability is transferred to a public body after closure once a series of conditions have been met. Where the pore space was owned or leased by a private entity during the operational phase, the rights to the pore space will have to be transferred to the public body taking on the liability for the site. This section considers the legislation around liability in relation to CCS in Europe and Australia. The Federal regulatory framework for offshore CCS activities is unique in Australia in that it provides mandatory indemnification by the Commonwealth Government for specified long-term liabilities. In 2008, the IEA concluded that, without CCS, the cost of attaining the 50% reduction in greenhouse gas emissions by 2050, would increase by over 70% in the long term. On the basis of this, it is widely argued that investment in CCS would make the transition to a low-carbon economy substantially cheaper and more cost effective. This section gives an overview of the costs involved in financing CCS to reach the 2050 target and beyond. This section looks at emission trading legislation and CCS in the European context. What are the aims and requirements of the Protocol? The Kyoto Protocol, which was agreed in 1997, provides Contracting Parties with legally binding obligations and targets for the reduction of their greenhouse gas emissions. It shares the Convention's aims, principles and institutions, but requires developed countries (those listed in Annex I) to reduce their emissions of greenhouse gases by at least 5 per cent from 1990 levels in the commitment period 2008-2012. The EU has agreed to reduce its combined emissions by 8 per cent below 1990 levels. This will be achieved by means of a so-called 'bubble', designed to allow the EU's target to be redistributed between the Member States to reflect their national circumstances, their requirements for economic growth and the scope each has for further emission reductions. The Protocol needs to be read in conjunction with the UNFCCC, as discussed above, since the Convention is the 'parent law' and the definitions contained within its articles are used in the Protocol. The Protocol has attached a 'monetary value to the earth's shared atmosphere' (UNFCCC) with the restrictions it has placed upon greenhouse gas emissions. The introduction of mandatory emissions targets effectively assigns a financial cost to greenhouse gas emissions and creates an incentive for the Parties to the Convention to seek the most cost-effective methods for reducing them. It is this latter element that is reflected in the creation of the flexible mechanisms (see Flexible mechanisms section below). The Conference of the Parties (COP) serves as the meeting of the Parties to the Protocol, which is known as the CMP. The meetings of the CMP are timed to coincide with the meeting of the COP and its functions are similar to those carried out by the COP. The first meeting of the CMP was held in Montreal in 2005, during the 11th meeting of the Conference of the Parties (COP). Those Parties that have acceded to the Convention, but not to the Protocol, may participate in the CMP, but only in the role of observers (e.g., the USA). The subsidiary bodies created under the UNFCCC, such as the Subsidiary Body for Scientific and Technological Advice (SBSTA) and the Subsidiary Body for Implementation (SBI), also serve the CMP (see UNFCCC page). In addition, the Protocol also established three further bodies, which provide advice and support to the CMP. The CDM Executive Board (CDM EB) and the Joint Implementation Supervisory Committee (JISC) supervise and verify Clean Development Mechanism and Joint Implementation projects respectively (see Flexible Mechanisms section below). The third body established under the Protocol is the Compliance Committee, which is responsible for overseeing Parties' compliance with the Protocol. In 2005, the CMP established the Ad-Hoc Working Group on Further Commitments for Annex I Parties under the Kyoto Protocol (AWG-KP), which is in charge of considering Annex I Parties' commitments under the Protocol 'at least seven years before the end of the first commitment period' (Article 3.9). Furthermore, in 2007, the Ad-Hoc Working Group on Long-Term Cooperative Action (AWG-LCA) was created under the Convention as a negotiating forum for Parties' cooperation (Decision 1/CP.13 - FCCC/CP/2007/6/Add.1). The activities of these Working Groups concerning further Parties' commitments and cooperation were expected to conclude at the COP 15 in Copenhagen, in December 2009. In the light of the failure to reach a compromise in Copenhagen, Contracting Parties decided to renew their mandate. To enhance the financial support required under the UNFCCC, Contracting Parties to the Kyoto Protocol have agreed the institution of an Adaptation Fund to sustain developing countries in adapting to climate change. This fund is mainly financed by a levy on Certified Emissions Reductions (CERs) issued in the framework of Clean Development Mechanisms (CDM) projects (see CDM section below). In Copenhagen in December 2009, the launch of a new fund, called the Copenhagen Green Climate Fund, was included into the Copenhagen Accord. However, this Accord was not legally binding and the operational establishment and characteristics of the Green Climate Fund were only agreed at Cancun, the following year (see Cancun Accord). The fund was made operational at the Durban Conference in 2011. Flexible mechanisms allow Parties to decide how best to achieve their required reductions during the commitment period, and are intended to lower the cost of compliance with the targets issued. Under the Protocol, Annex I Parties may use two project-based mechanisms to fulfill their obligations: Joint Implementation (JI) and the Clean Development Mechanism (CDM). Flexible mechanisms under the Kyoto Protocol also include Emissions Trading, which is a purely market-based mechanism established to stimulate cost-effective emissions reductions. Joint Implementation (JI) allows an Annex I Party to 'transfer to, or acquire from, any other such Party emission reduction units resulting from projects aimed at reducing anthropogenic emissions by sources or enhancing anthropogenic removals by sinks of greenhouse gases in any sector of the economy'. These projects are required to provide 'a reduction in emissions by sources, or an enhancement of removals by sinks, that is additional to any that would otherwise occur' (Article 6.1(b)). Article 6 allows a Party to undertake an emission-reducing project or a project that enhances removals by sinks in the territory of another Annex I Party. Emission Reduction Units (ERUs) obtained in this manner may then be used to meet the original Party's Kyoto targets although they must be 'supplemental' to domestic actions for that purpose (under Article 3). The Clean Development Mechanism (CDM) is another project-based mechanism, which generates credits that may be used by Annex I Parties to meet their commitments under the Protocol. Article 12 provides that Certified Emission Reductions (CERs) shall be generated by CDM projects, which assist developed country Parties (Annex I Parties) in meeting their emissions targets. Essentially, developed nations sponsor or pay for emission reduction projects in developing or less developed countries (non-Annex I Parties) in return for credits that they may put towards their own emissions targets. Article 12 requires that projects have the approval of all parties involved, provide real and measurable benefits, and reduce emissions below the level that would have occurred otherwise. The CDM is supervised by its Executive Board, which in turn operates under the authority of the CMP. Emissions Trading allows Annex I countries, and operators of regulated installations within them, to trade emissions credits in order to meet their targets under the Protocol (Article 17). An emissions trading scheme (ETS) is a 'cap and trade' mechanism, which requires Parties' governments to set an overall binding ceiling ('the cap') to greenhouse gas emissions from all regulated installations. In imposing the cap, governments also grant operators a certain quantity of emission allowances, each of which represents one tonne of 'carbon dioxide equivalent' that can be released into the atmosphere. Operators that use fewer allowances than those they have been granted, by achieving greater than expected reductions in their emissions, are entitled to sell their surplus allowances on the open market. Operators who choose to exceed their emissions cap can then purchase extra allowances from that market. The overall objective of an emissions trading scheme is to allow operators to decide the most cost-effective method for reducing their overall emissions, enabling those who achieve greater than required reductions to obtain an economic benefit. Operators may trade various types of units including: those initially assigned to them under the Protocol; Removal Units (RMUs) obtained through the employment of sinks; Emission Reduction Units (ERUs) gained through Joint Implementation projects; and Certified Emission Reductions (CERs) obtained via the CDM mechanism. Transfers of these units are to be tracked by registries at national and international level. For CCS in an emission trading scheme see EU Emission trading legislation. Article 12 of the UNFCCC requires all Parties to the Convention to provide details of the steps they have taken to implement its requirements. Various national reports have to be submitted, including: national communications covering all aspects of implementation for Annex I and non-Annex I countries; greenhouse gas inventories containing annual data on emissions and removals, for Annex I Parties; and National Adaptation Programmes of Action to be submitted by the least developed nations outlining their needs and priorities for adaptation. Kyoto contains more detailed provisions concerning the reporting and review of information submitted by Annex I Parties, as well as systems and methodologies for preparing greenhouse gas inventories. Annex I Parties were required to put in place, by the end of 2007, national systems for the estimation of emissions by sources and removals by sinks of greenhouse gases (Article 5). Parties must then submit annual greenhouse gas inventories and national communications demonstrating their compliance with the Protocol (Article 7), which will be reviewed by expert review teams (Article 8). The 'approved methodologies' referred to in Article 5, which are to be used by Annex I Parties for estimating emissions and removals, have to be those accepted by the Intergovernmental Panel on Climate Change (IPCC). The IPCC first released guidelines for this purpose (The Guidelines for National Greenhouse Gas Inventories) in 1994, and a revised set was released in 1996. Under the Protocol, Parties are required to undertake 'research on, and promotion, development and increased use of, new and renewable forms of energy, of carbon dioxide sequestration technologies and of advanced and innovative environmentally sound technologies' (Article 2.1(a)(iv)). Although 'carbon dioxide sequestration technologies' are not defined anywhere in the Protocol text, 'sequestration' here is likely to refer to the capture and geological storage of CO2 from power stations, rather than sequestration in terrestrial sinks such as forests or oceans. Under the Protocol, reductions in greenhouse gases made by removals from sources or through the employment of sinks, must be accounted for in a transparent and verifiable manner. The requirement to record removals and reductions in this way is partly based upon concerns about the permanence of storage techniques. In the absence of strict accounting mechanisms, once a credit has been awarded, there is little incentive to ensure the containment of a gas or to minimise its escape. Reductions made by CCS have raised concerns, because there remain issues regarding the security of stored CO2 and possible leakages. Currently there are two accepted methodologies under the UNFCCC for measuring the reductions in greenhouse gases made by Parties: inventories for measuring national greenhouse gas emissions; and those accounting for greenhouse gas reductions under Kyoto's flexible mechanisms. The current IPCC Guidelines for National Greenhouse Gas Inventories 1996 (as revised) are used in the preparation of inventories to be submitted under the UNFCCC and Protocol. An IPCC Special Report published in 2005 described these Guidelines as insufficient to address certain issues. A new set of guidelines was adopted in April 2006, the IPCC 2006 Guidelines for National Greenhouse Gas Inventories ('the 2006 Guidelines'). These contained a complete methodology for the treatment of CCS. The 2006 Guidelines provide Parties with an agreed methodology for estimating greenhouse gas inventories, which may be used for submitting their reports to the UNFCCC. Chapter 5 of Volume 2 ('Energy') provides emission estimation guidance on capture and compression, transport systems, injection systems and the storage of CO2. The 2006 Guidelines have yet to be officially sanctioned by the COP or CMP, although at the 24th meeting of the SBSTA in May 2007, there was official recognition and consideration of the issue. The SBSTA, in its Draft Conclusions, recognised that there was a need 'for continued consideration of the 2006 IPCC Guidelines in the context of the revision of the UNFCCC reporting guidelines for Annex I Parties' (see document FCCC/SBSTA/2007/l.5). Furthermore, the SBSTA encouraged Parties to 'gain experience' with the 2006 Guidelines and submit details of those experiences to the Secretariat. At its 30th Session, in June 2009, the SBSTA continued its consideration of the 2006 Guidelines. At this session, it was confirmed that the process for Annex I Parties to implement the use of the 2006 IPCC Guidelines should be conditional upon a revision of the UNFCCC Annex I reporting guidelines and the consideration of methodological issues associated with it. Despite the fact that work has been undertaken on this issue, until a final decision is adopted regarding the 2006 Guidelines, there is uncertainty as to whether individual Parties can use these Guidelines, instead of the revised 1996 Guidelines, in the preparation of their national inventories. On the view that the later 2006 Guidelines are more relevant and up-to-date, and that there is a gap in the scope of the 1996 Guidelines, the UK Department for Environment, Food and Rural Affairs (Defra) intends to use the 2006 Guidelines to incorporate any CCS activities. Norway has incorporated details of the Sleipner CO2 storage project in its national inventory report. Annex V of the Norwegian 2006 report, entitled, 'CO2 capture and storage at Sleipner West Field - storage site characterisation, monitoring methodology and results', provides a detailed summary of the amount of CO2 stored and the methodology used for these calculations. It is clear from this that Norway does not view the 1996 Guidelines, and their lack of explicit guidance in this field, as a bar to including stored CO2 in their national greenhouse gas inventory. For the main features and key legal issues associated with CCS as CDM project activities see CCS in the CDM page. Bakker S., Heleen de Coninck H. and Groenenberg H., Progress on including CCS projects in the CDM: Insights on increased awareness, market potential and baseline methodologies Energy Procedia, 1(2009), 4467-4474. Kerr, T.M., Legal and Regulatory Developments: The Path Forward to Advance Carbon Dioxide Capture and Storage as a Climate Change Solution International Energy Law and Taxation Review, (2007) 11/12, 232-240.
de Coninck, H., Anderson, J., Curnow, P., Flach, T., Flagstad, O-A., Groenenberg, H., Norton, C., Reiner, D. and Shackley, S., Acceptability of CO2 capture and storage: A review of legal, regulatory, economic and social aspects of CO2 capture and storage Energy Research Centre of the Netherlands, May 2006, ECN-C-06-026. Flory, A.; Podkanski, J., Legal aspects of storing CO2 International Energy Law & Taxation Review (2005). Redgwell, C., International Legal Responses to the Challenges of a Lower-Carbon Future in Zillman, D.; Redgwell, C; Omorogbe, Y; Barrera-Hernandez, L. (eds. ),Beyond the Carbon Economy [Oxford University Press, 2008], Chapter 5. Banks, N., Roggenkamp, M., Legal Aspects of Carbon Capture and Storage in Zillman, D.; Redgwell, C; Omorogbe, Y; Barrera-Hernandez, L. (eds. ), Beyond the Carbon Economy [Oxford University Press, 2008], Chapter 15. The Carbon Capture Legal Programme launched the 'EU Case Studies Project' in January 2010. The project analyses the implementation of Directive 2009/31/EC on the geological storage of carbon dioxide (‘CCS Directive’) in selected European jurisdictions - the United Kingdom, Germany, Poland, Romania, Spain and Norway. Each jurisdiction, for distinct reasons, provides an example of different approaches to the transposition and to CCS in general. The objective of the project is to identify some of the more subtle nuances in different legal cultures and to provide a better understanding of the rationale for national decisions in specific aspects of the implementation of the Directive. In particular, the focus is on those areas where the Directive leaves room for Member States' discretion or is ambiguous or silent. The project also considers the policy and political context within which the national legal and regulatory framework for CCS has emerged. The studies are deliberately designed to move beyond formal transposition measures to reveal more of the underlying dynamics and tensions involved in national implementation. Such elements are often crucial in driving domestic legal developments. The way in which EU Directives are implemented often reflects distinct legal and administrative traditions, and the case studies seek to present these in order to provide better insights on the development of CCS regulation. The outcome of the project is a series of reports from the six jurisdictions, based on key legal and policy questions and on a critical reading of the CCS Directive. The CCLP has coordinated the overall research and has carried out the UK case study. Independent experts have been commissioned to carry out research in Germany, Poland, Romania, Spain and Norway.